Apple leads the way in smartphone technologies so it is anything but surprising the iPhone is among the most commonly used portable devices on the global scale. This huge popularity has led to an ever-increasing demand for mobile applications designed exclusively to run on iOS-based devices. Online casino operators have also jumped on the bandwagon and many of the most renowned mobile casinos offer bespoke iPhone apps players can use to indulge in their favorite slots and table games while on the move. Key suppliers of casino software solutions like Microgaming, Playtech, NetEnt and BetSoft have responded to popular demand by adapting some of their most sought-after slot titles for mobile play on iPhones and iPads. More importantly, interactive casinos that are compatible with the iOS can be synced across a variety of devices, allowing slot fans to transition with unprecedented ease from their Mac computers to their iPads or iPhones. Typically, iOS-compatible slots pose as a great option for gaming on the go due to their enhanced graphics and smooth performance. 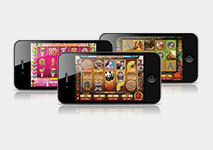 If interested to know more about playing the slots on your iOS device, we suggest you go through the following article. Slot fans the world over can rejoice at the fact Apple has decided to lift some of its restrictions on real-money gambling content and online casino operators are given the green light to create applications, compatible with iOS-based devices. The company implements two guidelines in regard to gambling-related content on its store. All applications that are related to real-money wagering should be available for free. 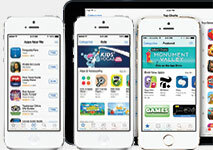 The second guideline prohibits gambling applications from using in-app purchases. Players from certain countries may still find it impossible to download real-money gambling content from the App Store. Apple maintains its firm stance on restricting gambling apps for some markets, like the United States, where players are denied access to gaming applications which involve wagering for actual money. However, this hardly can be considered a colossal issue since many of the most established mobile casinos have already adopted the HTML5 language and their slot libraries can be accessed directly through the browsers of iOS-based devices. What is more, the number of slot titles optimized to perform smoothly on iPads and iPhones is continually on the increase. According to the policies of the company, all content that is related to real-money gaming, be it sports betting, horse racing, poker or casino games, should hold the necessary licensing in the locations where the applications are used and therefore, should be limited to those specific locations only. Owners of iOS portable devices, who are interested in playing the slots for real money from the comfort of their surroundings, have two options to choose from. The first option is to look for the mobile casino’s application in the App store to see whether or not it is available there. If not, the best thing to do is to visit the casino’s website on your iOS device and download the app directly from there. In some instances, scanning a QR code may be a requirement in order to obtain the app. As was previously mentioned, players in countries like the United States may experience difficulties when it comes to downloading real-money gambling applications from the App Store since online (and therefore, mobile) gaming is illegal in most states. However, this is not to say such players will not be able to spin the reels on their iOS-based devices. A large number of mobile casinos further slot fans’ convenience by providing them with the opportunity to use their browser-based iOS apps. In this case, reel enthusiasts do not have to download and install anything on their mobile devices. They simply need to enter their preferred casino’s address in their browsers at which point, they will be automatically redirected to the mobile version of the website. As far as compatibility is concerned, players with older iPhones have nothing to be worried about. In most cases, mobile casinos that allow for instant play will run on older versions of the operating system like iOS3, which is to say if you own an iOS5 or iOS6 device, you most certainly will be able to load your favorite slots and make real-money bets on the go. According to some casino fans, the biggest downside of the iOS software results from the fact this operating system is not compatible with Flash media, which is to say some slot fans may be unable to play in-browser titles that require installing any version of the Flash player, new or old. The good news is more and more mobile casinos are leaning towards adopting the more universal HTML5 mark-up language to address this issue. Since the processors of smartphones, the iPhone included, are generally smaller while advanced mobile slots are more graphically demanding, some players who own older iOS devices are left with the impression the visuals are not as smooth when compared to those in desktop mode. Many slot fans prefer to spin the reels on the go using their iPads because of their larger screens and more powerful processors. Either way, you will find that iOS-compatible slots are exceptionally user-friendly since their touch screen interface allows for easy customization. You can set the reels in motion with a single swipe across the touch screen. One important thing to mention is that the slot libraries of iOS-friendly mobile casinos are sometimes slightly limited in comparison to what the desktop versions of the websites have to offer. One can rarely find a mobile casino that offers its entire slot collection that is available for desktop play. However, slot fans can typically play all the hottest slot titles from leading software suppliers while on the go. With casinos adding more and more slot variations to their mobile portfolios on a regular basis, limited choice will hardly be a problem in the near future. Sometimes, scanning a QR code may be necessary in order to be transferred to the mobile counterpart of the casino. Spinning the reels on your iPhone could not be any easier. All players need to do is open an account with a trusted mobile casino that supports this operating system (and there are plenty of those), deposit funds via one of the many reliable payment methods available and choose an iOS slot to play. In fact, picking which mobile slot to try out first is the hardest part of the entire process. We can help you make this decision as we have compiled a short list of five of the hottest mobile slots you can play for real money on your iPhone or iPad. Starburst is among the slot variations all reel enthusiasts can easily recognize. This highly popular slot is courtesy of established software developer NetEnt and this truly shows in the quality of the graphics and sound effects. The game is played across five reels and features 10 fixed paylines. The symbols on the reels are represented by vibrant, vivid gems that sparkle in different colors. 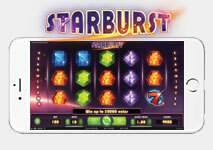 Starburst brings to mind the old-school 3-reel slot machines since the two highest-paying symbols in the game are represented by the traditional bars and lucky sevens. The betting range is flexible as players can wager anywhere between $0.10 and $100 per spin so it is safe to say the game is suitable for all bankrolls, big or small. What further adds to Starburst’s appeal is the hefty fixed jackpot of 50,000 coins. Additionally, there are great features that will further enhance players’ excitement, including the expanding Starburst wild which can substitute for all other symbols on the second, third and fourth reels. The wild also triggers up to three re-spins to boost players’ profits on winning combinations. Since the game is part of the NetEnt Touch collection, it allows for a quick and intuitive navigation on a variety of iOS-based devices. 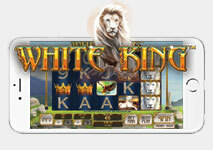 White King is a graphically advanced 5-reel slot with 40 adjustable paylines that has been developed by another leader in the online gambling industry, software supplier Playtech. The developers have invested a good amount of efforts in creating a slot that pleases the eye with bright, clear visuals and soothes the mind with relaxing audio effects in the background. The slot was inspired by the king of all animals, so some of the symbols players will encounter on the five reels include lions, lionesses, eagles, and lion cubs. The game also has some great extra features to offer, including the scatter with the White King logo which can trigger a round of 5 free spins. Another symbol players will benefit from is the White Lion wild which stacks on all five reels to form more winning combinations. Game controls are exceptionally intuitive and the interesting thing here is that players can adjust the number of paylines they wish to activate and bet on by using the two sliders, positioned on each side of the reels. This renders the game perfect for mobile play on one’s iPhone or iPad. 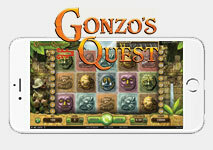 Gonzo’s Quest is yet another state-of-the-art creation of software developer NetEnt and is a favorite of millions of players across the world. Spanish conquistador Gonzo takes reel enthusiasts on a perilous quest for the lost treasures of Eldorado. NetEnt have truly outdone themselves with this slot that comes with superb animations, crystal-clear graphics, and immersive audio effects to fit the overall theme of the game. Slot fans can bet on 20 fixed paylines across five reels, with wagers ranging anywhere between $0.20 and $50.00 per spin. The Avalanche multipliers are among the most interesting features of this impressive slot. Players, who succeed in activating the 10 bonus spins by landing three Free Fall symbols, can potentially increase their profits up to 15x. The game has been fully adapted for mobile play and works seamlessly on a wide range of iOS portable devices. Fans of Agent 47 would certainly appreciate the 5-reel masterpiece with 15 adjustable paylines that is Hitman. The game is courtesy of Microgaming, one of the veterans in the development of casino software solutions, which alone guarantees players will enjoy a hassle-free gaming session on their mobile or desktop devices. There is the option to bet between 1 and 20 coins per payline, with available denominations ranging between 0.01 and 0.50. 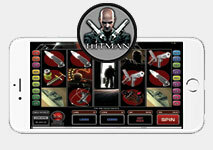 One of Hitman’s biggest attractions is the huge fixed jackpot of 270,000 coins but the slot also features an engaging bonus game, which requires players to choose a single target with specific bonus values. There is also a random multiplier on the winnings, accrued during the bonus game. The other strong points of Hitman are the rounds of up to 18 free spins with 2x multipliers on winnings, the expanding wilds, and the scatter symbols. Reel enthusiasts who decide in favor of giving this BetSoft slot a few spins should brace themselves for a proposition they simply cannot decline. 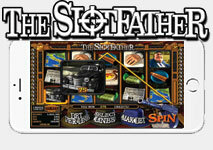 As soon as this 5-reel slot loads, the Slotfather will offer players “a jackpot they cannot refuse” – fair enough, considering one can possibly win a progressive prize that increases with every wager made on the game. Players will completely immerse themselves in the devious, dangerous underground world of mobsters thanks to the spectacular 3D animations that have become somewhat of a trademark of BetSoft slots. There are 30 paylines to bet on, with wagers ranging between $3.00 and $150 per spin, provided that all lines are active. The progressive jackpot is awarded randomly whenever you hit five Slotfather symbols on any active payline. However, in order to qualify, you are obliged to bet the maximum amount, allowed per spin. Other great features include the Sneaky Instant Wins, the Multiplier Mob Free Spins, and the Underboss scatter symbols. Of course, being part of BetSoft’s ToGo platform, the Slotfather is perfectly compatible with a variety of mobile devices and iPhones are hardly an exception.